Today after updating Chrome, if doing a search in Google I now get a spinning circle instead of Webroot's check mark. I see the check marks in IE whether using Bing or Google for searches. In Chrome doing a Googe search I get the spinning wheels, but using Bing's search in Chrome I get the WR checkmarks. WOT's ratings were not affected. Seems everytime there is a Chrome update Webroot has some kind of problem. Any idea how long till WR resolves this? Just got an update - we are making progress on fixing this issue. Devs think they have it figured out, so if that bears fruit then we'll need to get it implemented and QA'd and out to you guys. I use Chrome whenever possible, even though Google searches has no checks from Webroot, Bing searches in Chrome have the Webroot checks. I also use WOT which is another indicator of safety no matter which browser I am using. Hmmmm, rd52...I used to use WOT but stopped after reading/having seen mixed reviews as to it's efficacity. "Hmmmm, rd52...I used to use WOT but stopped after reading/having seen mixed reviews as to it's efficacity." It means Web Of Trust but it's users make the sites good or bad so I don't find it really trust worthy IMHO but some do. Web safety is not just about viruses and malware. WOT’s ratings are powered by a global community of millions of users who rate websites based on their own experiences. Add WOT to you browser for protection against online threats that only real life experience can detect, such as scams, untrustworthy links, and rogue web stores." Home user with spinners here as well, win 7, 64 bit. Is this related to the Chrome shield for unauthenticated script I have on all https sites, including this one? Hello eklan, welcome to the Webroot Community! Yes it is actually. However, I urge NOT to allow the scripts to run. 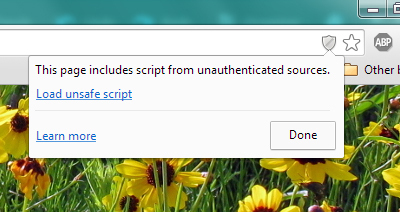 The problem here is that the message does not say WHICH scripts can be allowed. By allowing, you may be not only dealing with the WSA Web Threat Shield, but also any other unknown script which could contain malware. Google has recently released an update to the browser that is disrupting parts of the Web Threat Shield. The shield itself appears to be working and blocking unsafe sites, but as you may have noticed the 'reputation' check on search engine results are not: all we see on Chrome when doing a search is the constant circle at each result instead of the usual reputation indicator. Webroot is fully aware of the issue, and they are hard at work on it. The last update I have had is that a fix is or is close to being ready for Quality testing, and so hopefully we will have a fix in place soon. Until the fix has been completed you might want to use IE or FireFox, at least when using search engines. Please see THIS THREAD for more information as well as comments and updates from Webroot regarding this issue. I use Chrome for all my sufing. I feel it is one of the more secure browsers as it is constantly updated. The reviews seem to suggest that it is quite a secure browser and after using it for so long I am very used to it. So if I am doing a search for an 'unknown site' I use Bing search. Using Bing search in the Chrome browser, the Webroot check marks work fine. I don't know how other search engines are reacting in Chrome as I don't use any of the others. Got an Email informing of the fix. So while I was in my normal std user account in Chrome I went to extensions deleted the old WR filtering extension and enabled the new version. The WR checks and spinning circles totally disappeared, couldn't get them to work at all. I checked in my Administrator account and strangely everything worked, but not in my Windows std acct. I ended up deleting and reinstalling Chrome and reinstalling the WR ext. still a no go, it would not work. I was finally able to get it to work by opening Chrome in my Windows std. user acct., opening a tab with the WR extension, another tab with the WR extension web site page. I then threw the old WR extension in the trash and enabled the new version in the other tab. It worked, now everything is back to normal. Chrome is notorious for being stubborn with extensions once you have manually removed one. It is actually intentional on Google's part. With the number of garbage toolbar extentsions out there, and the problem of once you get rid of Ask.com for example the next time you do an update to Adobe or Java that toolbar can come right back, Google has put in security to attempt to block extenions from being re-installed once they have been manually removed. It is a good thing in general, but it does cause some hassles and headaches at times as well.